I honestly don’t know what to do. I feel helpless. I always have been. I always will be. It started at a young age, the devastating effects of heroin took a life far too soon. Someone that I loved was gone. What could I have done? A couple years later, it was my turn. You never know how incredibly intense the desire to fit in is until you’re faced with a decision. Drugs turned from something I hated into something I did. Thankfully, I never got messed up with anything too dangerous. Cutting became my addiction. In the darkest places on parts of me I knew would be left unseen, I controlled my emotional pain with the physical. It was my escape. I’ve been clean from cutting for 5 months now. But I’ve been there.. I am also not to quick to admit that I am an addict. I have been clinically labeled an addict and I have to check in with someone about my addiction often. Not many people know this about me. Mainly because I’m ashamed of what I’m addicted too. I haven’t acted on my addiction for awhile, but it’s still there.. I crave it. It’s my escape. Addictions kill and I am proof. Drugs killed a friend. Cutting killed my spirit. My current addiction stole my life and put me in such dangerous places it’s a miracle I’m not dead. I’m writing this now, in tears, as addiction is trying to claim another life. I feel helpless. I hate addictions, depression, suicide… Maybe that’s why I’m studying to be a Social Worker. I refuse to let these things take people’s lives. The brain is the most powerful organ in the human body. When it gets sick, it effects every other part along with it. My friend may be dying, but I refuse to let any other friends die. In my head, this means war. I know what I’m living for and I sure as hell know who I’m willing to die for. 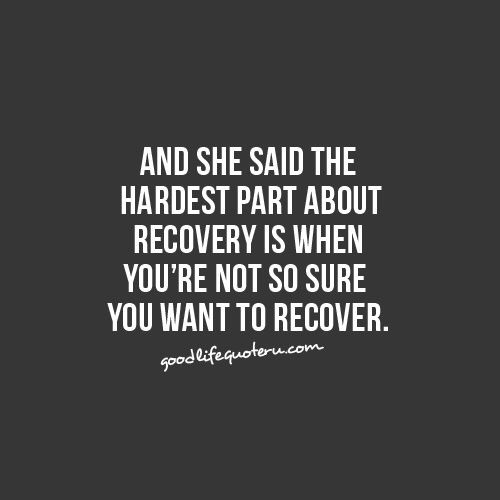 My final thoughts: in the picture above, the quote talks about not wanting to recover. It’s a truth. Addiction is a hell, but it is disguised as heaven. The world without our drug, bottle, blade, etc. is hell. Addicting is our escape. Previous PostPrevious Moving On Up..